Largest casino I've seen, the Venetian is a city within a city. I was invited by the Macau Government Tourism Office-Philippines (MGTO) together with other travel writers and bloggers for a familiarization tour to this interesting place last May and it was a beautiful experience with its cuisine, glitz and old world charm. The Venetian in Macau is bigger than it’s Las Vegas brother. The gondolas and faux facade gives you a taste of what Venice is about with singing gondoliers, multicolored building fronts and even a mechanically moving sky. Its a shopping mecca with a spectacular Cirque du Soleil production. The Venetian Macao in the Cotai Strip is the largest casino in the world. It’s the largest building in Asia and 5th in the world with over 3,000 suites. It opened in August of 2007 and already, it has entertained millions of visitors. 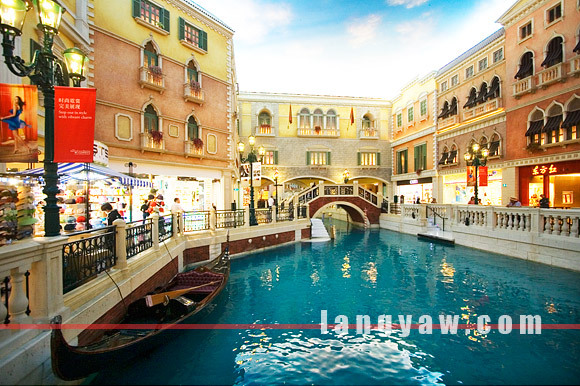 One of the attractions is the Grand Canal Shoppes which has one of the biggest retail spaces and restaurants with cuisines from all over the world. It has faux Venetian building facades and canals. Even the sky moves mechanically. Perhaps, one of the best reasons to go to the Venetian, other than the casino, of course, is Cirque du Soleil’s production of Zaia. It’s a spectacular musicale, circus and stunts that made my jaw drop in awe and wonder. It’s like being a kid again but you have this modern version with all the whiz bang stuff that Cirque is known for. Rather pricey but well worth the buck. If you can, get the best rows and be ready to be amazed and hum and be wide eyed. I remember the Boaters of the Gondola were Filipinos and they also sing very well. Very entertaining really!